"While the name doesn't exactly make the mouth water, the flavor and texture of clotted cream are the stuff of legends. The long, slow cooking sort of toasts the cream, which imparts a sweet, nuttiness that I don't think I've tasted in any other preparation. This is just delicious spread on warm biscuits or scones and topped with homemade jam." Preheat oven to 175 to 180 degrees F (80 degrees C). Pour cream into shallow glass or ceramic baking dish (an 8- or 9-inch square pan is ideal). Cream should be about 1 1/2 to 2 inches deep. Place dish in preheated oven. Bake 12 hours. Do not stir. Carefully remove from oven and let cool to room temperature. Cover with plastic wrap and refrigerate overnight or until completely chilled. Turn over a corner of the top layer of thickened cream; carefully pour liquid underneath into a container to use for baking. 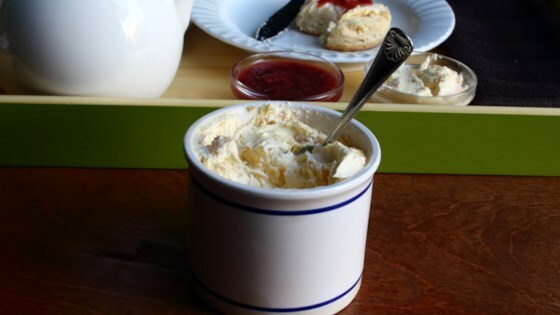 Pack the thickened (clotted) cream into a ceramic crock or canning jar. Cover and refrigerate up to 5 days. Insanely good, rich cream for biscuits and scones! This works best with good quality cream, preferably from grass-fed cows with a fat content of between 36% to 40%. Avoid anything that says "ultra-pasteurized," since it's been heat-treated, and you'll not get the same results. Most modern ovens go down as low as 175-180 degrees F (80 degrees C), which is ideal for this technique. 200 degrees F (95 degrees C) will work, but maybe check after 10 hours, and see how things look. Most difficult thing about making this is finding the non-ultra pasteurized cream. I have heard that some ovens don't have a temperature setting low enough. This is a wonderful treat for the winter months. best clotted cream I've made. delicious. thanks!